It’s important to dust your office the right way. Dusting tends to be one of those tasks that as soon as you are finished, you have to start all over again. Dust comes in many forms and is generated from many different sources, making it important to stay on top of your dusting schedule. 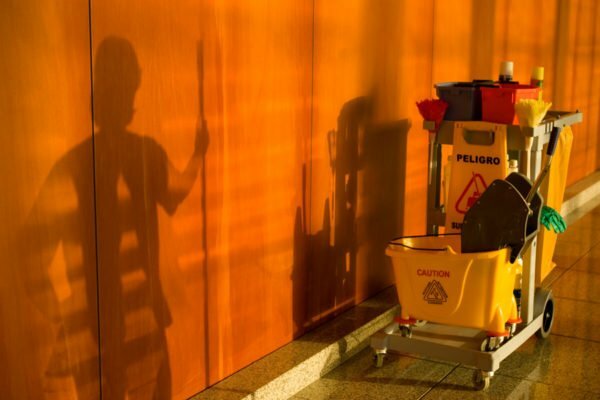 Dusting is an important task your employees need to do in every office building. Visible dust creates an unsightly work space, which people may translate into an image of neglect. A well dusted office building conveys a positive and pleasing image to all building visitors and occupants. A clean working environment also encourages neatness, promotes better work habits, and can reduce absenteeism. So why should you dust your office the right way? Dust high surfaces first and work downward. Start at one end of the room and move in a clockwise or counterclockwise direction. Move objects such as phones, paperweights, and pictures, dust under them, and then replace them in their original position. Wipe spots and smudges on walls, desks, etc. with a damp green microfiber cloth as you move throughout the office area. Remember to rinse the cloth when it becomes soiled, using only water. When cleaning computer monitors or flat TV screens in the conference room, use a dry, microfiber cloth and lightly wipe. Never use paper towels, tissue paper, or window cleaner, they can scratch or damage the screen. When dusting blinds, first dust across the top. Then close the blinds and dust the entire surface. Close blinds to the other side and dust the newly exposed surface area. Finally, use a vacuum to remove dust and clean hard to reach areas and upholstered furniture. If your office space is dusty and unclean, it is much more likely to foster the spread of the flu and other diseases between your employees. This is another critical reason to dust your office. The airborne dust will also cause your employees with allergies to suffer from sneezing, sore throat, runny nose, and itchy eyes. When your employees feel sick because of a filthy office, they will need to take time off work to recover. If they are suffering from allergies because of a filthy office they will feel tired and irritated all day long at work and they will not be very productive. Keeping your office clean will avoid this so that your employees stay healthy. Employees who are healthy and happy are more productive and perform better work. Foreman Pro Cleaning is a full service janitorial and commercial cleaning company equipped to keep your home or business in top shape for years to come. Our hundreds of happy clients can testify to the quality of our work, the efficiency of our professionals, and the beautiful clean that they experience. If you’re ready to see how a professional can upgrade your service and keep your clients happy, give us a call at 410-741-3450 or visit us online. To see testimonials and specials, follow us on Facebook, Google+, Twitter, LinkedIn, and Pinterest.